What About Those OT Prophecies of the Passing of “Heaven And Earth”? Does the Bible link the passing of the Law of Moses with the passing of literal heaven and earth? As noted in our second installment responding to Sam Frost’s article on Matthew 5:17-18 is that among Frost’s many claims,he says that the Old Law foretold the passing of material creation, the literal heaven and earth. Let me remind the reader that I observed that he did not give one single text from the Tanakh to prove that assertion. So, Frost says that the Law could not pass away until heaven and earth passes. He says that it would pass when it was all fulfilled– including the prophecies of the passing of heaven and earth. Yet, he did not offer a key stroke of proof for his claim that the Old Testament predicted the end of the space / time continuum. This is telling. In numerous formal debates, I have challenged my opponents to provide at least three OT prophecies of the yet future Old Covenant prophecies of the “end of time” or the passing of material heaven and earth. The utter desperation of my opponents has been incredible! One debate opponent, Bill Lockwood, refused to even try to give and OT prophecy of the passing of heaven and earth. I pressed and pressed him until finally, in written response, he said “Enoch!” Hmmm, I did not realize that Enoch was an OT prophecy! Side bar: One reason this issue is so important is because Peter says in 2 Peter 3:1-2 that his discussion of the Day of the Lord is simply a reiteration of what Jesus, the other apostles and the prophets who had spoken before, had to say about the Day. In his discussion of the Day of the Lord, he cites Isaiah 65-66. He also echoes other OT prophecies of the Day, including Daniel 9 and Malachi 4 among those that can be listed. My point is that if the OT prophecies that Peter cites do not predict the end of time, or the destruction of literal heaven and earth, then one cannot make 2 Peter 3 a prediction of the end of time! Anyway, from time to time, futurists do offer a few OT prophecies of the passing of heaven and earth to maintain their view. Space considerations prevent an extensive examination of those texts, but, I will list four of the texts that have been offered– which is pretty much the sum total of those offered. Let’s look now at the key OT prophecies that futurists claim predict the end of the physical cosmos. This passage is quoted in Hebrews 1:10 and we are assured by futurists that it must refer to the end of time. But, it is pretty clear that those who appeal to Psalms to establish the idea of a future cosmic cataclysm have not really read that chapter. They are proof texting. Let me make a few observations. This motif of the redemption of Zion is picked up in Hebrews 12:18f where the apostle says that Zion, is “heavenly” and it is “the church of the living God.” He also affirms that the coming Day of the Lord (for the redemption of Zion as foretold in Psalms) would be “in a very, very little while” and “will not delay” (10:37). Hebrews 12, picking up on chapter 1 and the prediction of the passing of heaven and earth, explains that it was the passing of the Old Covenant Zion- the Old Covenant creation, so that the everlasting kingdom would remain (v. 23-28). “This will be written for the generation to come, That a people yet to be created may praise the Lord. Now, unless futurists want to say that at the so-called “end of time” God will create another New People– necessitating the removal / negation / destruction of the body of Christ – then Psalms cannot be applied to any so-called end of time. The problem is that the only people to perish at the Day of the Lord, so that the Lord could create a New People, was Old Covenant Israel! There is much, more that could be noted from Psalms 102, but this is more than sufficient to show that the Psalm is not concerned about the end of time. It is about the salvation of Israel at the Day of the Lord. That would be a glorious day, but also a horrific day. The bottom line is that it has nothing, absolutely nothing to do with the end of material creation. 3. Let me emphasize a critical point here: The promise of Psalms 102 is an Old Covenant promise made to Old Covenant Israel after the flesh. This logically means that it had to be fulfilled while Old Covenant Israel after the flesh existed (or exists) as God’s covenant people– while those covenant promises were still in effect. It is axiomatic and undeniable that if a Law or covenant has been abrogated / annulled/ abolished, that none of its promises or penalties are valid and applicable. A dead law, a dead covenant, is, after all D-E-A-D. So, here is what that means. The coming of the Lord of Psalms 102 is the coming of the Lord for the redemption of Zion, the salvation of Israel. Paul said the coming of the Lord for the redemption / salvation of Israel would be in fulfillment of His Covenant with her (Romans 11:25-27)– “this is my covenant with her, when I take away her sin” (Romans 11:27). Thus, God’s covenant with Israel would remain in effect until the coming of the Lord for the salvation of Israel. This means that if Psalms 102 is not fulfilled, that Israel– Israel after the flesh– remains as God’s covenant people. It is significant that in a FaceBook exchange with Frost, I asked him if Israel after the flesh was still God’s Covenant people. Frost’s vacillation and self-contradictory answers were astounding! He actually said that since God is the God of the living and not the dead, that this somehow proves that Israel after the flesh still exists! The final point we will make from Psalms 102 is that David said the time of the passing of the heaven and earth would be at the Day of the Lord, when He would appear in Glory. “For the Son of Man will come in the glory of His Father with His angels, and then He will reward each according to his works. 28 “Assuredly, I say to you, there are some standing here who shall not taste death till they see the Son of Man coming in His kingdom.” (Matthew 16:27-28). The coming of the Lord “in the glory of the Father” the time of salvation, would be in the lifetime of Jesus’ audience. “Immediately after the tribulation of those days the sun will be darkened, and the moon will not give its light; the stars will fall from heaven, and the powers of the heavens will be shaken. 30 Then the sign of the Son of Man will appear in heaven, and then all the tribes of the earth will mourn, and they will see the Son of Man coming on the clouds of heaven with power and great glory.” (Matthew 24:30-31). And when would this be? Jesus stated emphatically that it would be in his generation (v. 34). I can only observe ever so quickly that in verse 31, Jesus cites Isaiah 27:13, a resurrection prophecy which is about the time of Israel’s salvation (Isaiah 27:10f). So, like Psalms, Matthew 24 is about the time of Israel’s salvation, when the Lord would come in glory, and it would unequivocally be in Jesus’ generation! (Incidentally, but significantly, both Isaiah 27 and Matthew 24:29f posit that salvation of Israel / Zion at the time of the judgment of Israel for shedding innocent blood. Salvation and judgment were synchronous events). Well, I have gone on longer than I intended to, but I hope that this (still brief) excursus on Psalms 102 demonstrates that it has nothing to do with the end of time. The reason I have spent this much time on this particular passage because in my formal debates, it is the passage most often appealed to. Psalms 102 is about the eschatological salvation of Israel at the Day of the Lord, the destruction of the Old Covenant people, and the creation of the New Covenant people. We will establish that even further as we proceed. 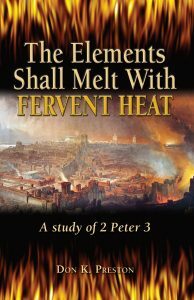 In the meantime, be sure to get a copy of my book, The Elements Shall Melt With Fervent Heat. In that book, I have even more in-depth analysis of Psalms and other OT prophecies that futurists often claim refers to a yet future passing of the physical cosmos. 2 Peter 3 has nothing to do with the end of time! Next Next post: Formal Debate- On YouTube and FaceBook! Link for watching!